If you enjoy playing tennis recreationally or are planning to take your game to the professional front, it is important to choose the right equipment that can help you reach the next level. Tennis equipment can be your biggest allies or your worst foes if you’re not careful when making a purchase decision. But when you have highly-experienced vendors to assist you in decision making, then you can rest assured that the equipment you buy will be completely top-notch and game ready. At World Tennis, we are the trusted partners-in-arms for many professional and amateur athletes in Miami, Florida. Our retail store is located right on Miami Beach and we stock a stunning range of tennis equipment here. State-of-the-art engineering meets casual style as we source the very best tennis racquets from world-class suppliers. Our range of tennis racquets is designed to provide the greatest grip, stability, flexibility and comfort to players of all ages. We stock racquets from brands like Yonex, Babolat, Wilson and more. Whether you’re getting in a 5-mile run or are practicing for your upcoming match, you’ll definitely need stellar shoes that have the right cushioning, support, grip, stability and comfort to perform your best. At World Tennis, we work with mega brands like Nike, Asics, Adidas and Brooks Running among others to get you the most stylish and efficient footwear that is completely form fitting. 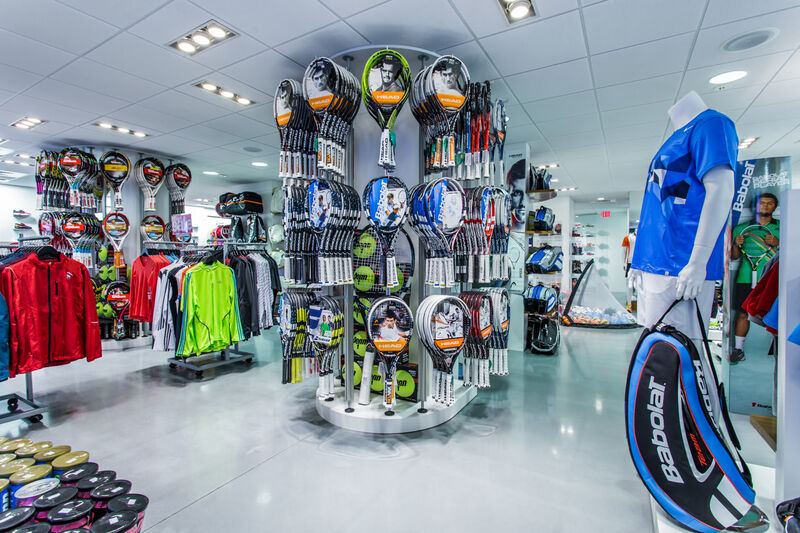 When it comes to tennis accessories, World Tennis has one of the largest selection of products in Miami. We stock an extensive product line which includes tennis grips, balls, racquet strings, string savers, vibration dampeners, sweatbands, training aids, supporters (wrist, elbow, knee, Achilles tendon & ankle), ball machines and more. The real testament to a brand is the endorsement by people who matter. At World Tennis, we are proud to say that we stock only those brands that have the patronage of legendary players like Stan Wawrinka, Martina Navratilova and Nick Kyrgios. Every product we have is sourced keeping in mind the changing trends in the world of tennis and by charting customer needs, expectations and desires. We follow the trends set by tennis icons like Rodger Federer and the Williams sisters among others and incorporate their advice into our product procurement. Our team of highly experienced customer service staff at World Tennis Miami Beach has years of experience working with athletes at all levels of expertise and we look forward to working with you, helping you find the tennis equipment that suits your requirements and styles.